An agreement where each shareholder is the owner of his or her own leasehold property within a building or scheme that is managed by the company. It provides clear and practical routes through the contentious areas of who controls what, and leaves the owners with an arrangement that maximises efficient, democratic management of the communal areas of their property. This document sets out how a company that owns the freehold of a property or housing scheme that has been split into multiple leasehold units will manage the freehold and maintain communal areas. The shareholders are the owners of the individual leasehold properties. Each holds one share and will run the company between themselves. The document has been principally designed to be put in place by a developer of a housing scheme who will transfer ownership of the freehold to the company when the last flat is sold. However, it could also be used for an existing company by shareholders who find themselves without an agreement that suits how they wish to manage the property. The sale of one of the leasehold properties and the change in share ownership may be a prompt to review the agreement. This document is drawn by a solicitor with experience of the problems that can occur in the management of a company where the owners do not have common interest – as they do in operating a commercial enterprise. In simple terms, complete control of the company is with the developer until it sells the last unit – or decides to relinquish control earlier. On sale of the last flat or unit, the developer transfers the last share in the company. He then transfers the freehold of the building to the company. He has no further involvement. That avoids the common problems that occur when the developer has work to be done but one flat owner will not co-operate. After the departure of the developer, provision has been made to make it difficult for one voice to be heard above all others. The owners of a flat under the roof must pay their share of garden maintenance while those on the ground must pay a proportion of roof repairs. We have added extra provisions for cases where they may be required, for example, assignment of leases and the period when the developer will transfer last of his share in the property. 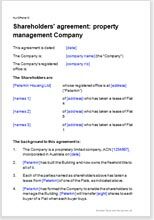 These are clear and can easily be edited or removed without affecting the remainder of the document.